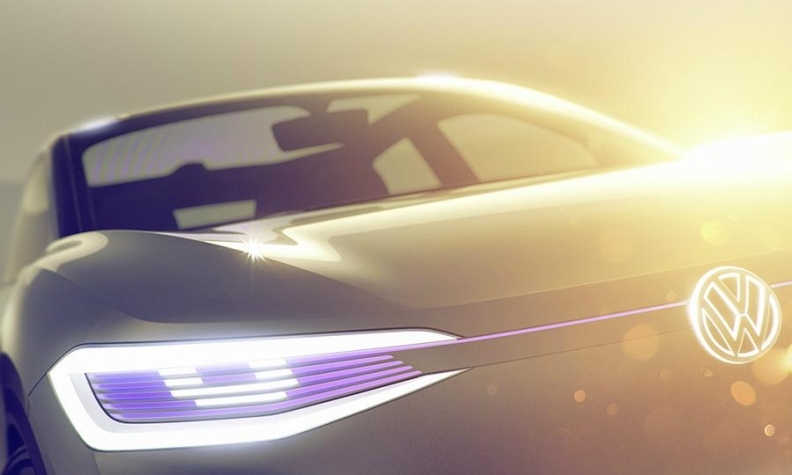 A teaser image from Volkswagen shows a full-electric crossover concept that the automaker will present at the Shanghai auto show. SHANGHAI -- Volkswagen Group's namesake brand is gearing up to roll out four affordable electric vehicles in the coming years. The German company has made “huge progress” in reducing production costs of its all-electric vehicles, Christian Senger, head of the VW marque’s electric-car project, told reporters Tuesday in Shanghai, where the nameplate is unveiling its first battery-powered crossover. The models, to be sold under the I.D. sub-brand, will be partly developed in China and also include a midsize crossover, a hatchback and a sedan. “Offering our electric cars for prices similar to combustion engine vehicles really is a game changer,” Senger said. “We’re using the need to step from combustion engine to electric cars to reinvent VW brand.” said the executive, a former developer of BMW AG’s project the battery-powered i3 model. Electric models are a cornerstone of Volkswagen’s effort to emerge from its diesel-cheating scandal and comply with tightening emission regulations across the globe. China, the VW brand’s largest market, is playing a key role in the industry’s move beyond combustion engines, as the government has laid out ambitious targets to fight smog and is pondering quotas for carmakers to produce battery-powered vehicles. While it has yet to make a full-year profit, electric-vehicle maker Tesla Inc. has challenged traditional automakers and its market cap surpassed both Ford Motor Co. and General Motors this month. But costs per vehicle are still too high to make electric cars economically feasible, and global manufacturers will be forced to keep investing in both electric and conventional drivetrains for years. The worldwide market for electric cars is forecast to grow 26 percent to 950,000 vehicles this year, with GM’s Chevrolet Bolt and Tesla’s Model 3 to be the best sellers, according to Frost & Sullivan estimates. VW sells tiny numbers of electric versions of its Golf hatchback and Up! subcompact. The division reiterated a target to sell 1 million fully electric cars a year worldwide by 2025. Tesla’s Model 3, the third in its product range, is widely seen as a litmus test that will show whether the company can master the surging complexity that comes with higher production volumes. That contrasts with Volkswagen, which dethroned Toyota Motor Corp. as the world’s best-selling automaker last year, giving it the scale to share costs across a much higher number of cars. The German automaker was slow to develop fully electric cars and has been prone to engineering excesses and bloated costs, which are still evident in weak profit margins at the namesake brand. Herbert Diess, head of Volkswagen’s biggest division, has pledged to double the marque’s operating profit margin to 4 percent of revenue by 2020 and lift it further to 6 percent by 2025 despite costs for developing electric cars and automated driving features. The profit margin doesn’t include the brand’s two highly profitable Chinese joint ventures.